for the discussion of the proposed track plan for my O scale modular switching layout. and then a screenshot of the SCARM plan was loaded into MS Paint to have the scenery drawn in. SCARM is a wonderful tool, though it's somewhat limited in what track files are available to it. so the plan isn't exactly to scale as my own turnout radii differs from those in the planning files. This is a second draft of the plan, and I've already spotted something I'm going to change for the next draft. There's a grade crossing and a road at the bottom of the layout that is at a right angle to the track. it makes this road totally pointless. it would actually be a difficult scenic element to get correct. therefore I'll be removing it from the plan when draft number 3 comes around. which could cause issues down the line when the layout is operated? There's a runaround at the end of the line, between 12 and 17 on the plan. To save space, the end of the runaround is a sliding sector plate, which I guess isn't that clear on the plan. I'll make sure to highlight it more clearly on future drafts. 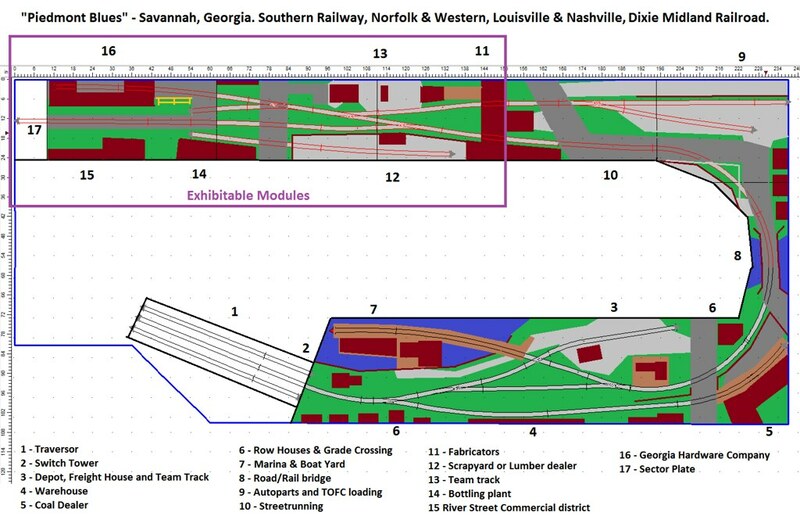 Sorry for the late reply ... after demanding a new 'Track Planning' Thread ! Couldn't see the wood for the trees ... after a boring Bank-Holiday of garden cutting-back. Hope you had some good sunshine, depending on which side of the cloud-band you were on ! I see what you mean about that surplus 'road to nowhere'. How high do you think the Coal Dealer unloading coal-drops would be, compared to ZERO ? It looks like the coal-drop spur would hold 1 - 2 cars maximum ? I guess that is possibly the only 'grade' on the plan. ... I can't help wondering if the 'traverser' could somehow become a Car-Float ! But I guess 3-tracks would be difficult to install, unless a 3-way switch was used. 2-tracks might not be enough. Just thought it could maximise the scenery potential at that point. The Road/Rail Bridge with 'street-running' looks pretty cool. I do wonder if that baseboard section could be made a bit wider, maybe up to your existing boards 2' width. Perhaps you have a window in the room there though ? 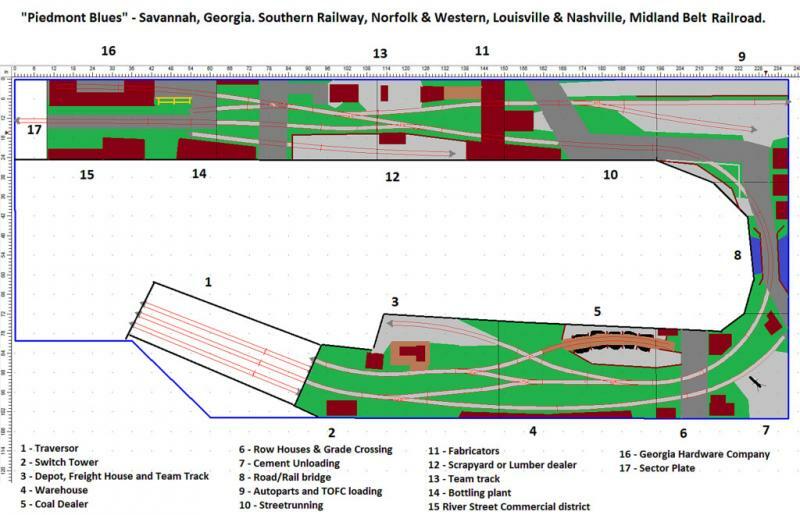 I really like the Track Plan generally & think it has a TON of great Ops. moves in it. It could EASILY work in HO or On30 or even 1:35n2, with some allowances for the different scales. It's a def. MOOSER for sure ! I'd love to see the 1st draft of the plan ... Just out of curiosity. I actually think I might have just seen the '1st draft' in your 'layout build' Thread Dan. Yup, that's the first draft all right! Okay, I'll try to respond to your points as you made them. The coal unloading spur I'll play by ear. and I'm thinking to start the gradient transition immediately after the switch. which I believe has been done in reality when absolutely necessary. when ensuring there's plenty of height for the coal drops. allowing me to fit a road between the two which could run down a ramp into the pit if needed. The coal dealership building will be based on a set of plans from an issue of model railroader from the 1960's. 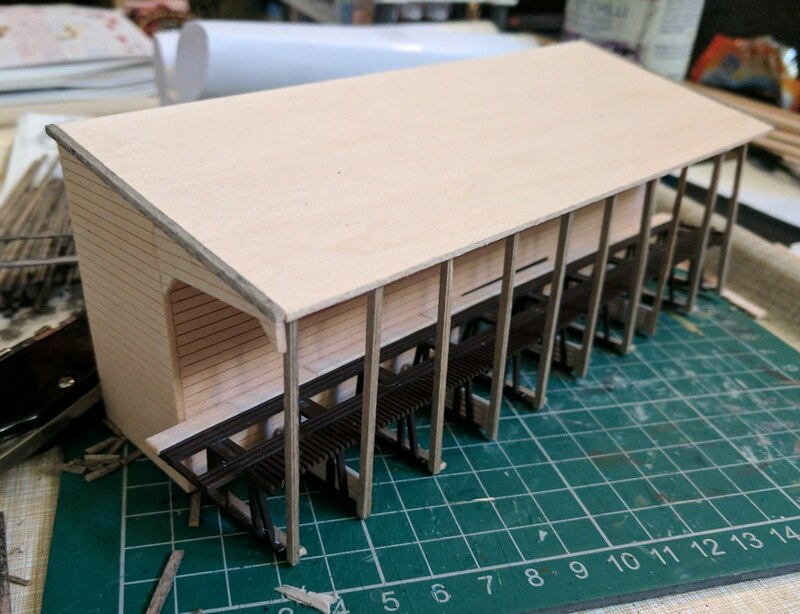 I started a version of the structure in N scale a few years back, and I've always wanted to revisit it. with the coal drops being on a trestle built out from the warehouse side. and the whole structure - coal drops and all - are covered over by the warehouse roof. I plan to make the roof a little higher than the plans and also fit a woodchip loading chute underneath the roof above the drops. It's a very interesting building, and definitely one that begs to be modelled. making that structure essentially three industries in one. 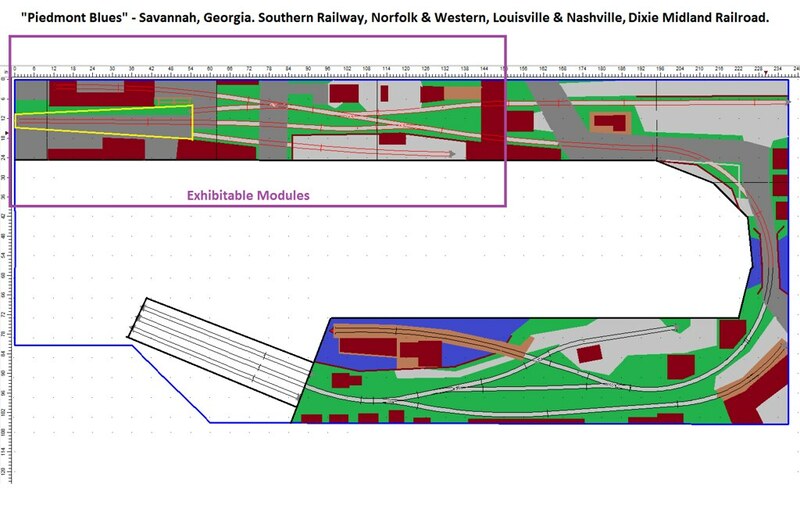 and would form the 4th board on the right hand end of the section labelled as "Exhibitable Modules" on the plan. As such, the traverser IS going to be scenic, but it will be done up as a 'slice' of yard tracks. The tracks on the traverser will have correct track spacing, will be ballasted, the ground cover will be applied wherever ballast isn't. allowing us an "excuse" to have extra locomotives sitting off on one of the traverser tracks. and have the whole sheet of 9mm ply which forms the top of the board move left and right. but I'll lay the track on the connecting scenic boards in such a way as to account for this. The board depth for the bridge section is to account for the space required to have my workbench underneath it. 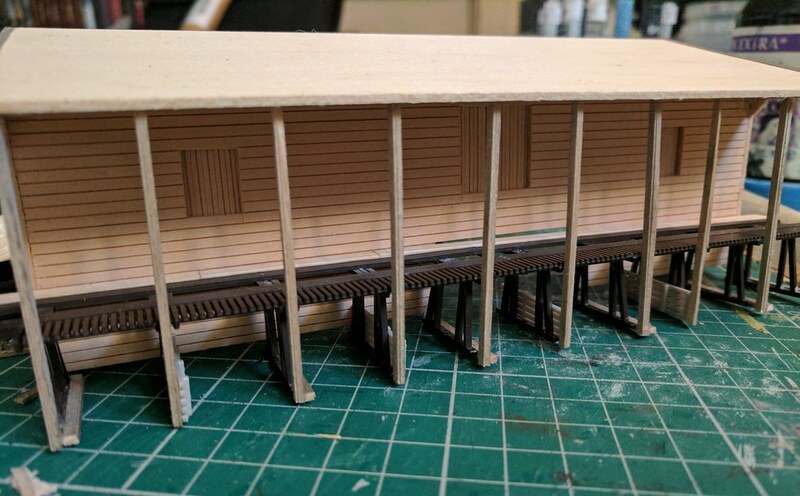 as I will need to fit storage shelves as well as at least one deck of a HO scale layout above it. The plan is eventually to have a two deck HO layout mounted on shelves above PB, if this is possible. which I wouldn't be able to do in O due to the way the room narrows at the left hand side by the door. Regarding the coal merchants, I found some photos of the N scale version. Should give you a general idea of what I'm trying to describe. Obviously I can't share the plans as they are from an issue of MRR. Whilst cooking dinner I had a bash at a 3rd draft of the plan. Things have been moved around and streamlined. should give more space for scenery. In some of said freed up space, I've moved the Southern Railway whistlestop style depot from the other side of the layout. It should make passenger operations more interesting than just running a few feet off of the traverser and back again! The tracks on the traverser will have correct track spacing, will be ballasted, the ground cover will be applied wherever ballast isn't." ... I realized that ^^ about the traverser, just as I Posted. A good move I think, 'scenic-ing' it up a bit. Staging tracks can sometimes be a wasted scenery potential to be grabbed. I just love car-floats ! Draft No.3 looks like an interesting update. No doubt there may well be a few more ideas & updates to come as well. Nothing like a bit of 'tinkering' ! NICE ! coal drops model in 'N' scale ... For sure a bigger version will look good, modded for 'O' scale.